Microsoft has begun to roll out a new preview build of Windows 10 to those in the Insider program currently on the Fast ring. This new build, version 11082, is the first build from Microsoft's Redstone development branch (RS1), which is set to be the next major update to Windows scheduled for public release next year. As the current Redstone build is very early in its development, none of the features that will eventually make it into the final build have been included. This means there's no new Cortana functionality, no deeper Office 365 integration, and no updates to the Windows 10 Action Center. Build 11082's updates still revolve around "product improvements based on the feedback we’re hearing on the November update", according to Microsoft's Gabe Aul. However, the company is working on improvements to OneCore, the shared core that is used in every version of Windows, that will make it easier to develop apps across all platforms. There are some issues with build 11082, which is why Microsoft has restricted its release to the Fast ring for now. Language packs will fail to install when running this build, and progress dialogs for copying, deleting or moving files won't appear. Some app default settings will also be reset, which will cause Music & Video to default back to Windows Media Player. Gab Aul also announced today that Windows Insiders on the Fast ring should prepare for faster updates. Starting in January, Microsoft will release more builds to Insiders at a more frequent pace, with the company changing their Fast ring release criteria to more closely match internal release rings. Users that don't want faster updates are advised to switch to the Slow ring. This has been the best OS experience so far of any Windows I've used from the 90's onward. I would agree. There has been a new more "customer friendly" approach to this one and the end product is showing improvement. Better yet, they are actually listening to our comments and taking action. They now represent what a company should be. Luckily for you; I've already eaten today. Thank god that they are accepting / making changes on the basis of feedback as given by Insiders. That's really GOOD. Keep up the good work under the leadership of Mr. Satya Nadella & let Windows-10 become the best OS Ever, after say a period of 9 to 12 months of its official release (29-07-2015). Besides a few driver issues (which I could fix) for older hardware I've had absolutely no problem with win10. It's fast and it's the windows I recommend to people (especially if they have laptops). Yes me too. Installed it on a variety of very different machines now and other than 1 issue with an audio driver fixed by getting the latest version from the vendor I've had no real problems since day 1. I run multiple copies of Visual Studio as well as SQLServer / MySQL and other database servers as well as a bunch of other dev tools simultaneously with office Virtual Box and other resource-hungry applications without a hitch. My only gripe and its a minor one as I don't tend to use it is they need to sort out the favourites/bookmarks in Edge and allow plug-ins - especially adblock. *face palm* What a train wreck this company has become. In a hurry to self-destruct. Who outside of Microsoft, after reading all the issues this preview build has is even considering downloading this update? This release pace is ridiculous, it serves no purpose. I think they are trying to, what's the word, get people "used to"(acclimate) to a constantly changing OS so that eventually you won't even remember that you had a choice to look back in the past. This has just become madness. Unless you are someone who uses your pc for just email and funny youtube videos, then you don't need to upgrade. I suppose you do know @Puiu that MS are not pushing the update to Win10 by stealth on those users of Win7 enterprise edition. In other words MS dare not muck around with those large corporate users do actually do WORK on their PC's. I like many others do do WORK on it. and I want an OS that does not interfere with doing that WORK. So it don't want it to change, not function correctly, automatically upgrade to a new OS, give BSOD's ..whatever. The OS should be invisible - the programs that do the work on the PC are what matter. Meanwhile MS are quite happy to foist the upgrade on to the unsuspecting home user. The fact that it is FREE should also tell you all you need to know - and that is to avoid it. The general rules is with anything free - that 'you' are the product. I'm sure that by the end of July next year it might work properly when they start charging for it. I'm sure also that I will eventually upgrade - when Win7 goes out of support in 2020. In the meantime windows update has become more like a virus itself than a security update with everything having to be checked and quite a lot of KBnumbers having to be rejected. 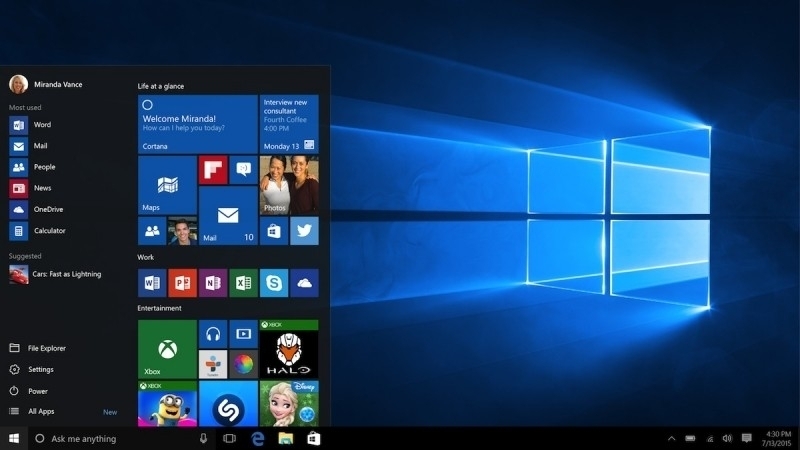 unless you have software that is incompatible, in what way is windows 10 worse than 7? how does it interfere with your work? as a programmer let me tell you this in a more serious tone, for work win 10 is much better than win 7. it's faster, has less BSODs, it's easier to fix, the new command prompt helps any developer that works with Maven or ANT and even the task manager is much better. all of your problems are superficial. you actually don't have any real problem and are just hating it based on false information or preconceptions. you read too many hate comments and did not actually even try to use win 10.
edit: and please don't put large corporations here. I know many that still use win xp (I even know banks that use it). they have different needs. the OS being better or worse is not one of them. Exactly this. I hated Windows 8 before it released and after I used it. Windows 10? Love it. That is, after turning off all the privacy stuff. I must be doing something wrong. I can honestly say, I can't remember the last time I had a machine which actually blue screened. Not XP, not Vista, not Windows 7.